I never considered myself a car person. That was my dad. He knows facts and details about cars that still blows my mind. And yet here I am, the one in the family doing car reviews. Just a little disclaimer: first, I am not a car person. Remember that. I look at features with the eyes of a mom. How will my family “fit” with this car? How easy is it to learn and how comfortable is it to drive? 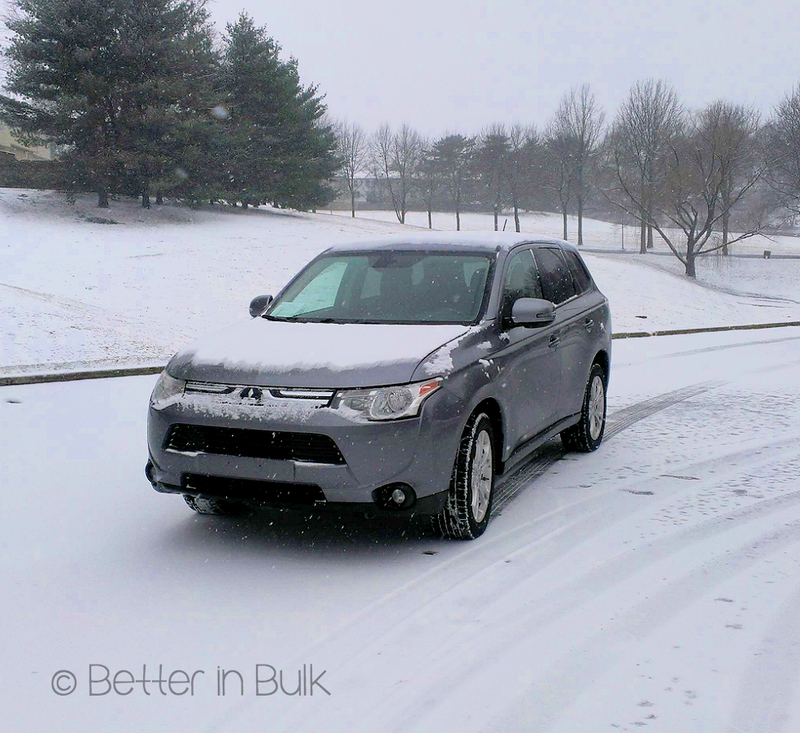 Second, I was given a 2014 Mitsubishi Outlander SE S-AWC SUV to drive for a week. No other compensation was received, and all thoughts are my own. 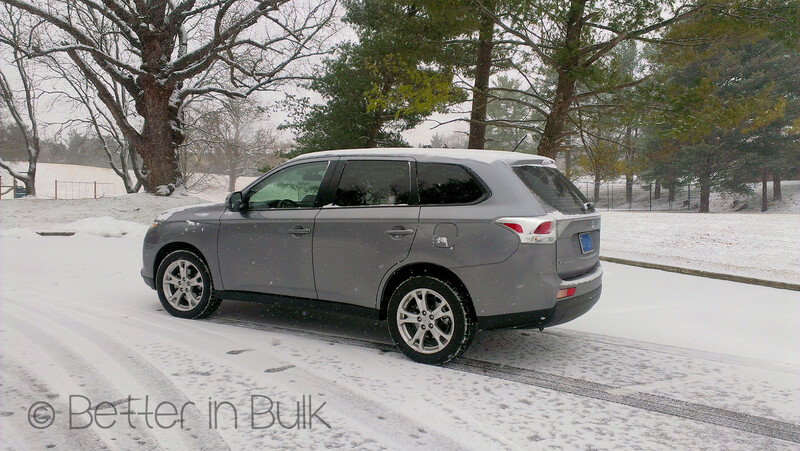 The top photo is a stock photo of the Mitsubishi Outlander, and all others are pictures I snapped myself. I drove a 2013 Mitsubishi Outlander Sport last year and other than the similarities between Mitsubishis, I felt like this newer, larger model was a totally different car. 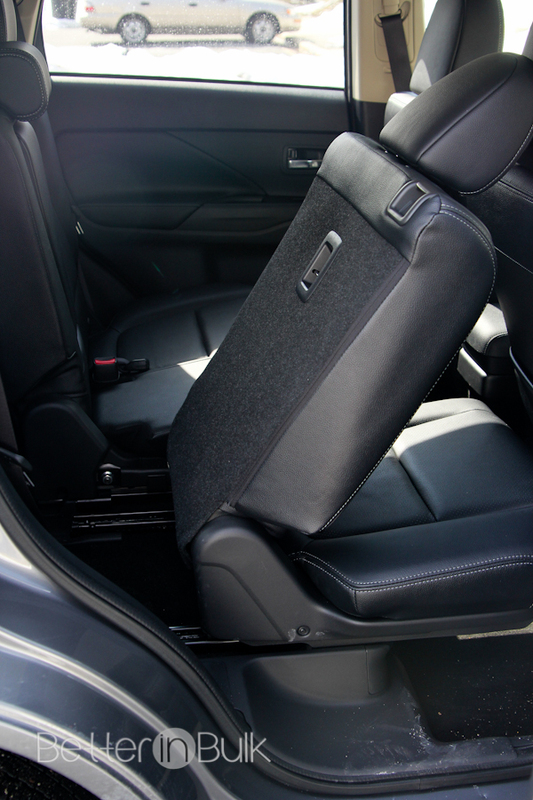 Where the Sport seats 5, this Outlander SE seats 7, with 2 seats in the front and back, and 3 seats in the middle row. As a mother of a rather large family, I HAVE to own at least one 7-seater vehicle. And in my opinion, this 7 seater would not be an ideal car for a family that needed all 7 seats regularly. That’s not a mark against the Outlander. I have yet to find a mid-sized SUV that would comfortably fit 7 people *and all their stuff* (especially when any kind of luggage is involved…and we tend to take a lot of road trips). That said, I think the Outlander would be perfect for a family of 5 with 2 extra seats for carpooling and friends. 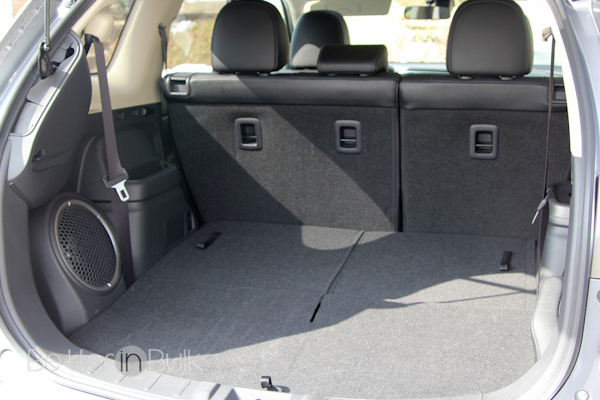 When in the car for normal around-town driving and road trips, I’d keep the back 2 seats folded down to allow for extra cargo space in the back. 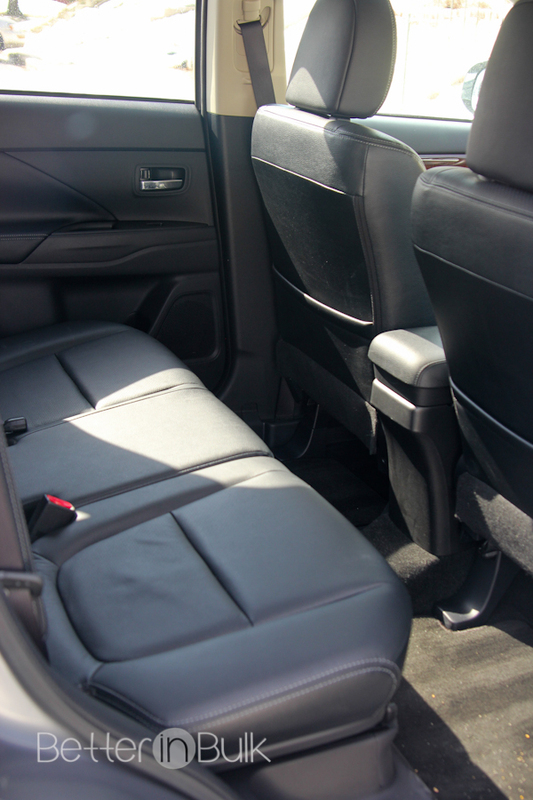 One of my favorite things about the Outlander was the ease with which the seats could adjust. Whether it was a kid hopping into the back row or scooting the middle row back for more leg room or folding the back seats down to store all my groceries, the process was so easy. 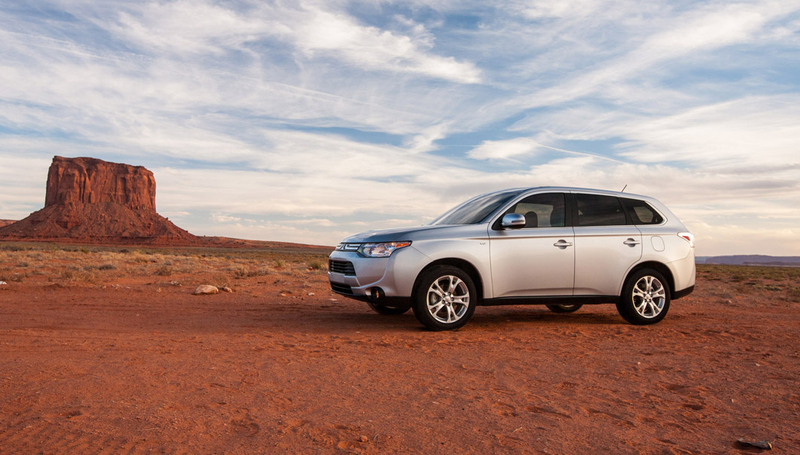 The Outlander is comfortable to drive and very easy to figure out. I loved that I drove all week (183 miles) and only used up about a half a tank of gas. The ECO mode definitely makes a difference. What I didn’t love was that driving in ECO mode definitely zapped the power. It took a while to get up to speed (granted, that helps it be more fuel efficient…). And like I said above, if this were my car, I would need more cargo space. The third row definitely eats that up. 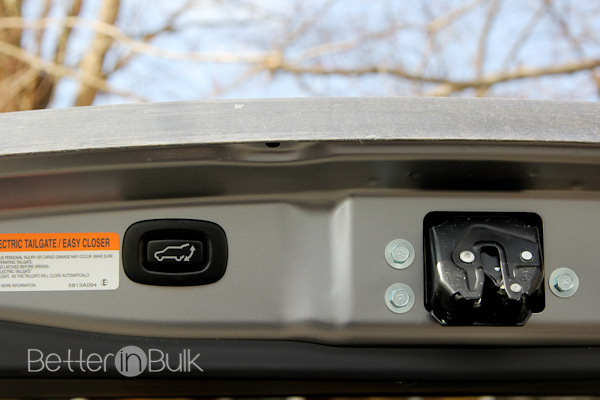 I loved the button on the back hatch that allowed me to easily push it to close the door, even with an arm full of groceries. Definitely a mom-friendly feature. 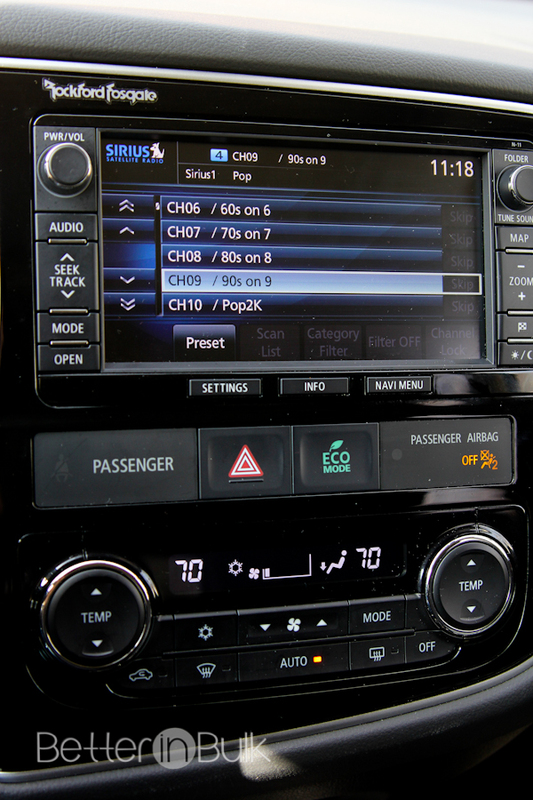 One feature I had mixed emotions about was the Lane Departure Warning (an optional feature). While I think it’s fantastic to have a warning beep when you’re straying from your lane, I found it a little too sensitive for my tastes. 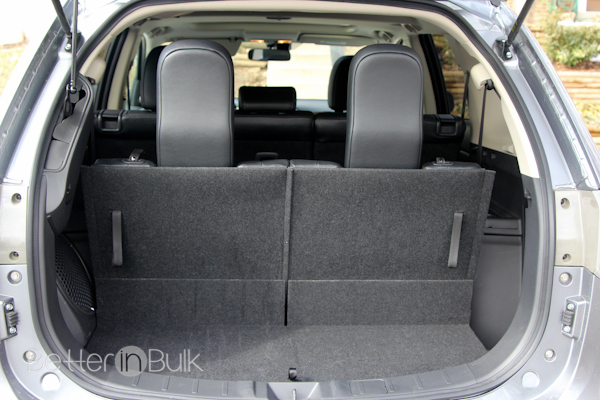 In the end, I would definitely recommend the Mitsubishi Outlander SE for the busy mom with 1-3 kids who occasionally drives other kids around and needs a few extra seats. Many thanks to Mitsubishi for loaning me the car.